An event called Winter Wonderland is set to be held on December 26 at CedarBridge Academy, featuring Immortal Stone Love and the Big Bad BodyGuard. 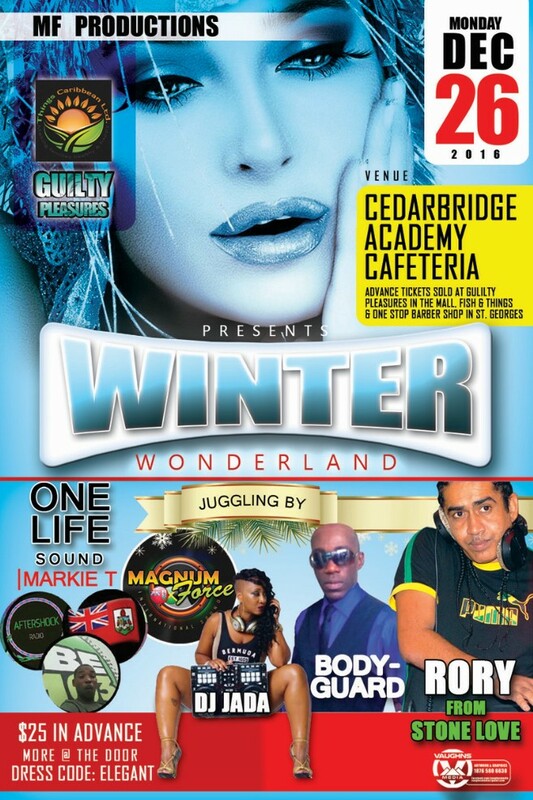 A spokesperson said, “The best of Jamaica meets the best of Bermuda at Winter Wonderland this holiday weekend at CedarBridge Academy Cafeteria. “This is going to be the party of the year. The Immortal Stone Love Movement with Selector Rory and Bodyguard with the original selector Johnny is known for creating an unforgettable party atmosphere spinning music from classic dub plates to Michael Jackson. “Both Rory and Johnny has a unique juggling style that will keep you dancing all night long. “This night will be filled with all types of genres and to start it all off will be the best in local DJ’s Magnum Force with the First Lady of Magnum Force DJ JaDa, One Life Sound and Markie T of Vibe 103 FM. “This is a night of sparkle and elegance and the dress code will reflect that. “Winter Wonderland is $25 in advance and more at the door. Ticket are sold at Guilty Pleasures, Fish and Tings and One Stop Shop Barber in St. Georges.